There’s a lot of feverish chat about Dave Cameron just staying on in Number 10 even if there’s an anti-Tory majority, especially if the Tories alone happen to outnumber Labour (like that matters). We are reminded of the way the Tory press hounded Brown as a squatter for (quite rightly) remaining as PM five years ago until it was clear he couldn’t command a majority. But there’s one crucial difference between 2015 and 2010 that seems to have been completely forgotten about. Dave’s legitimacy as Prime Minister is based on the Tory coalition with the Lib Dems. If he decides to try to cling to office past any point when it’s clear the numbers don’t work for him, would Nick Clegg try to stay on with him as Deputy Prime Minister? It seems unlikely to say the least. Clegg knows that if Tory and Lib Dem seats together don’t get them to 323 (or near enough with the DUP), it’s over: he’s a pragmatist in the way his boss isn’t. And either way it seems inevitable that the Lib Dems will have just taken a major kicking, delivered in part by the Tories in the south-west of England. This might make cooperation harder even if they could inch over the line, let alone if they’ve lost their collective majority. If Cameron tries to cling on through some unconstitutional definition of “largest minority” as legitimate, it couldn’t be sustained if Clegg resigned (and if the Lib Dems abandon the Coalition). If the Tories can’t assemble an absolute majority from somewhere, including with the Lib Dems, I’d say they wouldn’t even be able to cling on through a single news cycle without Clegg. 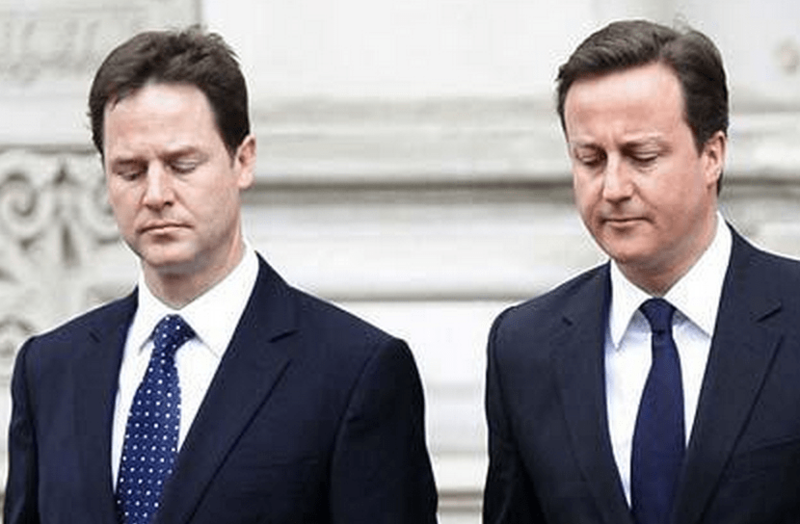 And of course, there’s more than one way for Clegg not to stay as DPM to potentially help them. If I were Labour I’d have thrown absolutely everything at Sheffield Hallam with that in mind. Another guest post from our pal Duncan Thorp on the Smith Commission report. Thanks Duncan! Lenin, Guevara, Khomeini, Robespierre, Smith. Well not quite, but change of some kind is coming, it transpires. Broadly speaking, the Smith report is what we could have predicted. It’s somewhere between the radical demands of the maximum devolutionaries (“everything but war/money/foreigners”) and the counter-revolutionaries. It’s fair to say that the result was not weak and tokenistic but it wasn’t even in the next village to Home Rule either. It somehow feels reluctant and slightly miserable, with an occasional spark of genuine enthusiasm. There may also be a hidden sting in the tail in areas such as Income Tax; the package could be a mixed blessing. With devolution of certain financial powers but not others, an awkward settlement might leave a Scottish government simply forced to implement Westminster cuts. We’ll wait and see. Also why was the process like 1979 and not like 1997? I.e. it was about a list of powers to be devolved – as opposed to a specific set of powers retained at Westminster, and then everything left over was devolved. There are many additional policy and tax powers that could make more of a difference and improve lives, like corporate and employment law and regulation. 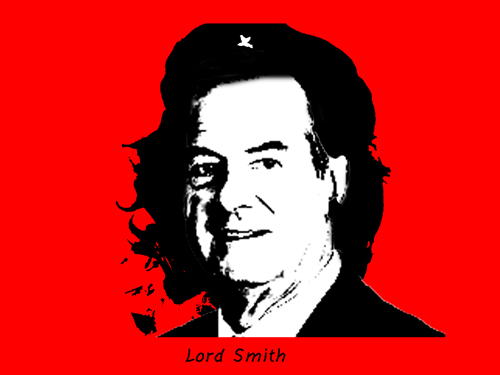 Smith was absolutely right to say that we should have “powers with a purpose”. There wasn’t enough of that specific thinking. Statutory CSR and beyond for businesses (phased legal reform to genuinely balance profit with social/environmental concerns). 50/50 gender equality on all company boards. A living wage (end state subsidy for in-work benefits – plus no tax paid by anyone earning it at a 35 hour week or less). Pay ratios (pay of CEO linked to lowest paid worker in the business). Right to employee ownership (democratic vote to ask the workforce if it wants a co-operative). Employees and customers elected to sit on the boards of all large businesses. FOI laws to apply to any business delivering public services (this could already partially happen in a devolved context). Better regulation for harmful industries like tobacco and weapons. Minimum of 1% of the workforce of all big businesses from hard to reach groups – ex-offenders, long term unemployed etc. Many of these ideas are now mainstream as we simply seek to build a more prosperous economy and more profitable and ethical businesses. Policies that are not that radical anymore and not “right wing” or “left wing” either. Devolution needs to be more of a revolution after the Smith report. Real change will only happen if the process doesn’t stop at the doors of The Scottish Parliament too – it’s about genuine localism, neighbourhood democracy and local community empowerment. The unspoken point underpinning this whole process is “why devolve anything else at all?” Indeed why do we have devolution in the first place? Why can’t or won’t the Westminster System of governance reform society? If a UK Labour government was elected why wouldn’t they just do these kinds of things? The answer is that it’s not about political parties or their policies, it’s about continuing with a failed, undemocratic political-economic system that pro-actively prevents change. The centralised Westminster System is slow and conservative and always will be and it’s bad for everyone in the UK. Perhaps the revolution will happen after the next election in that London. Political and economic power goes hand in hand. Both need to be relentlessly decentralised, shared, dispersed, spread and pulled downwards to streets and neighbourhoods across the entire UK. Proper devolution. Scotland is currently leading the devolution agenda – but there’s plenty more to come. (N.B. If you don’t like the Smith report at least recycle it, burning is so bad for the planet). Today’s guest post is from Duncan Thorp, who’s previously written for us about social enterprise and hate in politics. Thanks Duncan! We’re living in exciting times, Scotland has changed for the better. Nothing’s changed but everything’s changed. 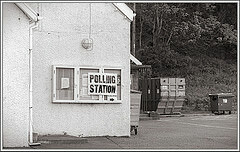 The referendum has been recognised by most people as an exercise in peaceful democracy. It’s true. In terms of the vote itself, the huge level of popular participation and the technical and legal agreements, it was incredible. 97% of the voting population registered to vote. 16 and 17 year olds enfranchised for the first time, an 85% turnout. A true Scotland-wide debate. More information, slogans and facts flowing like never before. All this over an extended timeframe, far longer than any election. We should genuinely celebrate this achievement. Only with historical perspective will future generations understand how powerful it was, an independence movement without bloodshed is virtually unheard of. A few bad eggs are as serious as it got. But there’s another side to this exercise in direct democracy. The environment of the wider society that it took part in was very much anti-democratic. The dominant state narrative of Britishness is ever-present in every aspect of our lives. In this context it’s nothing less than a miracle that 45% of those voting wanted independence. Much of the mainstream corporate media was of course a blatant case of misinformation, bog standard bias or agitprop. Years of daily, unrelenting, anti-independence news from nearly 100% of the print media can’t be dismissed. Broadcasters often struggled with their values and biases in favour of the status quo. Any media “neutrality” simply means that a story includes views from both sides – it doesn’t cover the decisions to include/exclude certain stories in the first place. Similarly, large corporations making even vague anti-independence statements, while wielding huge economic power over jobs and investment, were leapt on by the mainstream media. The very fact of the unequal economic power balance in favour of big business meant that any potential relocation was a huge threat (genuine or not). Indeed without straying into silly conspiracy theory territory, it would be naïve to suggest that HM Government and all the apparatus of the British state, were not deployed (under the radar) to save the state itself in its most critical moment of need. Would you lie back and allow your own power to be fragmented and taken away? It’s also perplexing that the British nationalists of the far-right were absent until after the votes were counted. It was upsetting to see a mob performing Nazi salutes, singing Rule Britannia and burning a Saltire in George Square, Glasgow. They clearly didn’t get the memo about the “war against nationalism”. Where were they in exercising their democratic rights during the campaign? It’s certainly unfair to suggest that every no voter was simply fooled or voted out of fear. Some were emotionally dependent on the British narrative and some were basically happy with the way the UK had turned out. Many people voted no because they didn’t think that the economic case had been made. They just disagreed with the other side. Acceptance of the referendum result is vital; we can identify flaws while still abiding by it. It’s all relative. We must move on. But getting back in the box is not an alternative. “One Scotland” unity, while well-meaning, is easily abused. Orwell’s Unity is Strength springs immediately to mind because unity is often a code word for compliance and conformity. There’s no place for eat your cereal politics. There is only wisdom in crowds, not in elite decision-making. The huge participation wasn’t simply because of the subject, it was because we, the people, were making the actual decision ourselves. Unlike in elections, we were not voting to choose other people to make decisions for us. One of saddest things I read on 19 September was Happy Dependence Day, a slogan but also a defiant recognition of the need for autonomy. We’ve been too conservative in using the powers that The Scottish Parliament already has. By using current and newly devolved powers a real difference can be made. From the missing link of radical devolution to local communities, land reform, community energy and building our own community organisations to real public sector reform. We need creativity and commitment. We also need to drive forward social media and democratic, inclusive, unbiased media. We don’t need alternative media that just reinforces our own views without challenge. There are many incredible people-led movements across the world and there’s also a wider war against democracy. We should be aware of these many campaigns against elite, minority rule and for direct people power. It’s only with mass and persistent action that fundamental change happens. While the UK state infrastructure remains powerful, the unionist campaign was temporary. The Indy infrastructure is now thriving. Energised, motivated and determined, they’re going nowhere. Much of this has thankfully gone beyond narrow nationalism and indeed beyond narrow independence. It’s not about the 45%, it’s about the 100%. We now need this to be a democracy movement. But forget the challenges, the truth is self-evident. Autonomy and authentic, direct democracy is addictive. One taste and people want more. This vote was important but it was just one step as part of an ongoing journey. Like the French Revolution it’s a bit early to say what the referendum result means. The next steps need to be open, inclusive and fast but more of that in another post. In this I thought I’d talk about the day itself. I’ll start at the end: ultimately the result was a slightly pyrrhic victory for me. Despite a clear, decisive and consistent No across Scotland we just as clearly lost Glasgow. If you’d told me at the start that we’d stay competitive in Kelvin (which was Yes by approximately 2000 votes) I’d have been very happy with that: we’re one of the few constituencies which voted for AV in 2011 and are a close 3 way marginal between Labour, the Greens and the SNP. We still lost though, and clearly need to do more work. The count started ok, I met a lovely Green while sampling who was good company during the bits we weren’t staring at piles of ballot papers. Feel very sorry for the staff on our table who had to recount one box three times because somebody had put their polling card in as well which buggered up the numbers. It didn’t stay friendly though. 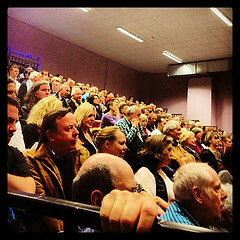 Once the overall result became clear the SNP contingent went quietely up the back of the room and the Greens seemed to dissapear leaving the front by the stage to the RIC crowd who began chanting in an increasingly aggressive and antagonistic manner. Classy. Standing shoulder to shoulder with friends old and new, some of whom I’d met that week or that day, in the Emirates with a lump in my throat and a lack of feeling in my legs waiting for the news we knew was coming that we’d lost Glasgow was a really powerful experience. Not one I want to repeat again. But that was the end of polling day. The day had started for me at 6.30 when, having managed to avoid the early morning leaflet run, I got up to stand on my local polling station for 2 hours. When I got there one of the many non-party Labour No activists who turned up in the final run in was there, along with 3 Yes people. My heart slightly sank as I recognised one of them. The Saturday before we’d run a stall at the local farmers market which had gone well (turns out people appreciate it if you pay for a proper stall rather than setting up your own trestle table at the edge) and had been harrangued by her because the only reason she could think of for me not supporting Yes was because I hated democracy. Having tried to explain to her, actually, I thought Yes would reduce our democratic control she moved onto arguing that a Yes vote would mean we had the power to reform local government. I didn’t have the heart to tell her it had been devolved in 1999 and substantially reformed by the second Labour / LibDem coaltion. A providential supply of biscuits from a passing voter were duly shared before a phone call informed me that CNN were at the polling station around the corner. Turns out one of the Labour stalwarts staffing it probably ended up on media in at least half a dozen countries. When the second shift arrived I took off for a shower and breakfast before we started the GOTV. Didn’t really have any idea if that was going to be necessary or not given the predicted turnout but, as it turns out, I’m very glad we did. After an initial run at some of the social housing around Whiteinch we decided to throw the strategy in the bin (I mean take a tactical decision at grassroots level) and just knock every door in the tower block. That worked out pretty well: a few yes voters who were going to vote anyway were outnumbered by a few “well, I don’t know if I’ll vote but if I do i’ll vote No”. That turned out to the theme of the day. Based on that I made a run into Bath St to get some wider ranging contact sheets that had everybody except confirmed Yes voters on them and it was around then that, in retrospect, I lost it. It started innocently enough. Having leapt out of a car, up some stairs, grabbed some folders, waved at the phone bank and leapt down a woman standing on the street introduced herself, said she was a visiting MP and asked if we were going to campaign rooms. I didn’t quite bite her hand off as I bundled her into the back of the car but it wasn’t far off. Not long after I was balancing a phone between my ear, clipboard in one hand, pen in another dispatching her and others to the doors of pensioners (it was 2pm, they’re the only people reliably in at that time of day in numbers in Partick) 3 stories up. I wasn’t quite inhabited by the spirit of Jamie the angriest man in Scotland but it wasn’t the most dignified thing I’ve ever done either. Another run to Bath St to set phone bank strategy for the evening, a sit down and a quick passive smoke. By this time it was quite clear don’t knows and undecied and uncontacted Labour voters were breaking pretty heavily for us. Which felt pretty great, I have to tell you. It’s easy to know, but not to feel, that you’re not talking to the opposition at this point and I had no idea how that would translate overall picture. As I mentioned, Kelvin is a weird constituency. I headed to Thornwood primary school for the evening rush with some apprhension. For the previous fortnight two stalls had been at Partick station, one Yes, one No. Neither associated with the main campaigns – Yes Partick West had a private facebook page and a locked twitter account and was hadning out Green Yes and A4 photocopies about secret oil fields. The No stall was run by Labour councillors from the very distant past, the communists and the lodge. Police had stepped in at least once during the previous week. Fortunately neither had shown up at the polling station as we’d feared: the biggest threat was apparently the drivel being talked threatening to lead to fatal boredom. Having gathered another volunteer I headed off for the last run of the evening. One of the things they never tell you how much of politcs is that quite a lot of it involves hanging about on street corners with a clipboard waiting for other people to show up. When everyone had arrived, sorted out who was going where and divvied up the last of the material I set off with two people: one of whom I’d known for less than 12 hours, one for less than 20 minutes (both lived up the road, albeit across a cruical constituency dividing line). Polling day is weird like that. I’d say I’d never known a final knock up like it but I’ve only really known half a dozen so it’s a small sample set. You could have built a house on it it was so solid. Low rise blocks of mixed social housing, some shared equity some socially rented. When we got to the top of the first block I thought we were in trouble. One of the “I’m voting No” out cards we’d put through when canvassing a few days previously was lying on the mat. Wondered if someone had pushed it back through. Happens sometimes. Marked them down as “Voted, Yes” and moved on. Same thing on the the floor below except it was outside a door of someone who I knew had already voted No but post. So we knocked the others anyway. Turns out the residents in that block had gotten so fed up of Yes canvassers they’d put them the cards out to ward them away. Same in the next block. A few people were voting Yes (and one who had done so by post said she’d regretted it now) but I was feeling pretty good by that point. Then we got outside. One block left to do, and a group of half a dozen small kids aged between maybe 6 and 10 come up to us and slightly suspiciously ask what we’re doing and what side we’re on. When we explain we’re No it changes. They go utterly ballistic, we give out the last of out stickers, posters and anything else left in the bag and demanded we go to their houses as their parents had already voted No. The rosette I’m still wearing from polling station duty causes some infighting as I try to explain they need to share. In retrospect “polling and sharing resources” was perhaps not the best phrase to use but I was phyiscally knackered and emotionally all over the place having wildly swung between feelings of “this is going OK” to “we’re going to lose badly” previously. It was a very good note to end the GOTV stuff on though. First things first. We lost. We know how and why we lost, too. There was a solid base of natural No voters for them to build on, and their demographics have been well analysed in the aftermath. Many people just feel British and think their governance should reflect that: personally I don’t really feel national identity either way, but so be it. 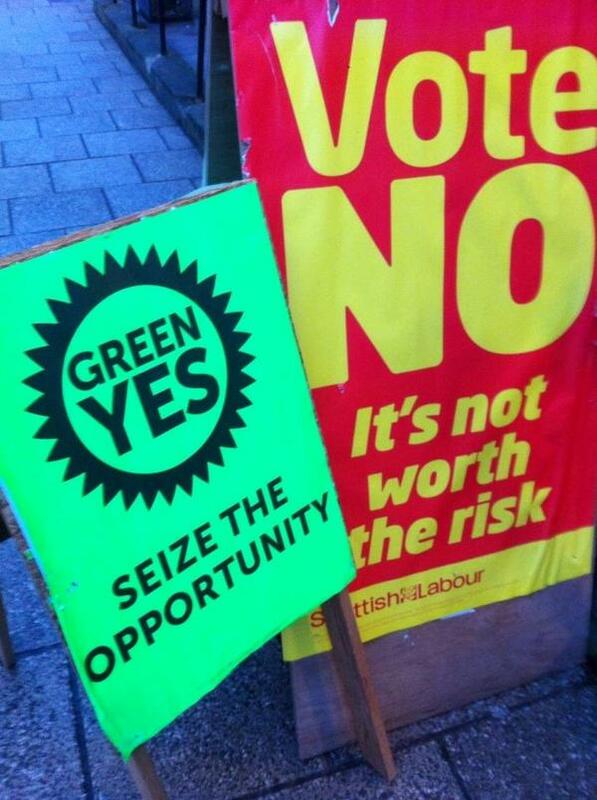 Beyond those groups, enough of the swing voters were secured for a flagging No campaign when they played two cards. First, a campaign of fear and lies, run by Number 10 and their media cheerleaders, using banks and big business to quash change. Second, of course, that promise of more powers. We may abhor the first, and we may be convinced that the second will prove to be a sham too, but we still lost. And we need to accept it. That doesn’t mean going cold on the idea of independence, mind, any more than you should give up on any other principle or objective when you hit a setback. The nationalists I know won’t do so. But, perhaps more importantly, I don’t think we non-nationalists for Yes will either. The ones I speak to are, like me, much more committed to independence than we were a year or five years ago. Friends who came over to Yes in the last week or month sound like they’ll never go back. A large majority of the Scottish Greens’ membership joined in the last few days, too. Most will be Yes voters, but many will be No voters who want a radical slate of additional powers. The party has changed, and it’ll also be a lot closer to a “big party” electoral force on the ground in areas across the country where we simply didn’t have a decent activist base. Meanwhile, the Yes activists on the ground, the true heroes of the Yes side, are networked, experienced, motivated, and informed like never before. The SNP had a great machine already, sure, but the breadth of the Yes movement eclipsed them. The No side, on the other hand, predominantly activated their existing operations. This is not the time to talk about another referendum, or even to spend too much thought on the last one. The specific circumstances which made the Scottish electorate into the 45% and the 55% has passed. There may be a time for another referendum, but only when the circumstances permit it, demand it even. Right now it is totally inappropriate. And there’s much more to be done right now. Besides, in many ways we won. It certainly didn’t feel like it on Friday, but over the weekend, as the dust settled, I became more Tigger than Eeyore. Let the No side have their triumphalism, their sense that Scotland has been put back in a box: we haven’t been, and we can’t be. For one thing, it might have been less close than we thought a week out from the vote, but it was still way more close than anyone predicted a year out (aside from some of my more enthusiastic SNP friends). Whole cities voted to leave the UK. Even in our worst areas almost a third of voters backed independence. That 1.6m people voted Yes is extraordinary. At the beginning of the campaign Yes Scotland set a target of a million pledges: bear in mind the total Holyrood turnout in 2011 was less than 2 million. A chunk of SNP voters were always going to vote No (the stereotype being the anti-Labour Perthshire resident who does well from the council tax freeze and loves John Swinney’s reassuring managerialism), and a bigger chunk of Green voters did so too: both offset by the Labour voters who came over to Yes. That vast Yes total should therefore be regarded as extraordinary and significant. Sure, less than the No vote: I can add up, but extraordinary nevertheless. Remember how far away even having a vote looked just a decade ago. Back in the day, the 1998 devolution settlement was described as the settled will of the Scottish people, but less than two decades later the debate was being framed by the Westminster parties themselves as more powers versus independence. The 1998 settlement, and the weak post-Calman additions to it: they’re dead already. The reality is the settled will changes. It moves slowly, perhaps, but the last twenty years have seen it move in one direction: in favour of a higher proportion of decisions being made in Scotland. The centre of gravity is now devo max, unquestionably. It’s not my first preference. But I’ll take it if I can. Tam Dalyell opposed devolution because he thought it was “a motorway to independence with no exits”. To have arrived at our destination this week would have suggested a proper German autobahn with no speed limits. We may not even be in the fastest lane on the motorway. It may even just be a modest A road. But I think it’s likely we will eventually get there. This is where the work needs to be done now. And that’s a project which reaches out beyond the 45%, and especially allows the Yes side to make common cause with those in the 55% who voted No because they believed the pledges of more powers. After all, the Record’s front page used Photoshop to engrave them onto a parchment, so they must be real. Are they, though? We don’t know at this stage. The disarray and machinations between the Westminster parties suggests nothing real will happen. They think it’s time to worry about England now (and they’re half right – they should be worrying about both Scotland and the rest of the UK). They offered a lot, albeit incoherently. They made it all sound substantial, and they said it would be quick. They promised to involve us. On all of those things we should both take them at their word and not trust them an inch. Let’s rally round this next task, the one Alex Salmond rightly set out. Let’s have a debate, an open debate, and then tell them what we think their promises mean. What we heard them say. Quote their own promises back to them. Define what Devo 2.0 looks like, not wait for them to see if Devo 1.2 is sufficient for us. Not settle for a bunch of tax powers designed to be as likely to be used as the 3p Scottish Variable Rate of income tax, let alone powers designed to push Holyrood towards austerity. Not just tax powers, either: primary powers over every domestic policy area that can be done differently within one nation state. Let’s push in the same direction on that, and bring in No voters who wanted those powers but who also felt independence was too big a leap. Aim to include not only the Greens who went for No but perhaps also the 10-15% of SNP voters who did the same. And the newspapers who opposed independence so vigorously but argued for devo max: let’s see if they meant it. Let’s also concede something. Cameron wants English Votes on English Laws out of self-interest, but I want it out of democratic principle. I have English friends on the left who are as infuriated by the failure to answer the West Lothian Question as any ‘kipper. There’s only one democratic answer to “should Scottish MPs with no remit on policy areas devolved to Holyrood be allowed to make decisions on those same policy areas for England and Wales?”, and that’s a no. It applies in spades if we get devo max as well, and that should make it clearer which Westminster laws don’t affect Scotland. There may be some more sophistication required with drafting, but it’s not impractical. And if you’re a partisan thinking that bloc of Scottish MPs in some way helped deliver more left policies, you’re wrong: read this. What’s more, the same logic applies to Welsh and Northern Irish MPs, in line with either the current devo settlements for them, or with whatever may follow. Being an MP for a non-English seat may become a part-time job, voting on defence, foreign affairs, a few similar issues. But the jobs will still exist, which should be a consolation for Labour. In fact, there’d be no reason to continue with the smaller number of MPs per capita outside England either. We all deserve an equal say on defence, on foreign affairs, etc. How the rest of the UK governs itself (for England is that just the same old English MPs? Is it a separate English Parliament? Devolution to English regions?) must be up to them. I hope to see a Yes-style movement for radical constitutional change take to the streets of the rest of the country, adopting the same spirit, agitating for Westminster’s semi-democracy to be reformed out of all recognition. But that’s a matter for them, even if we might feel able to go and help support their campaign, just as many English radicals came here to help us. The problems they face, after all, overlap extensively with the ones we’ve identified in Scotland. But we must continue to have our say about the powers we believe Scotland needs, the powers we were offered. That’s up to us, and we must redouble our efforts to secure them. We also have the perfect vehicle for holding the Westminster parties to account for it all. The timing couldn’t be better: the Westminster election in May. In Scotland, much as some will wish it not to be, much of the debate will be about whether the Vow has been met, whatever we do. This process, whatever it becomes, will determine what powers the next Scottish Parliament will have, elected a scant year after that. Sure, I wanted all power to come to the Scottish Parliament, to the Scottish people. But let’s see if we can go a good way further down the road away from a centralised British state. I may think that leads to independence, but for now it doesn’t matter whether it does or not. There’s a natural majority for devo max, at least as the next step, and the polls show it. If we get it, and it just works, maybe that’s where we’ll stay: maybe there’ll never again be an appetite for an independence vote. It’s possible that devo max could indeed be the end destination for that settled will of the Scottish electorate. But if the Westminster parties let us down and we don’t get those powers, or if whatever gets devolved clearly doesn’t work in practice, there will be another vote on independence soon enough. I’m convinced in either of those circumstances another vote would be justified, and we could walk a Yes with the support of many who voted No last week. So let’s go with the grain. Let’s make securing devo max the focus of the Scottish part of the next UK General Election, alongside resistance to the Westminster consensus on welfare, immigration, and the rest. Use the ballot box again to force them to deliver the powers we want as an electorate. Let’s be clear that they can’t fob us off with something weaker now the referendum isn’t hanging over them. Accept that independence is off the table, maybe for now, maybe forever, and respect the will of the electorate. If we get what we’re promised then many of the other issues I care about, from climate change to inequality and decentralisation, will be in the hands of the Scottish electorate at the Holyrood election a year later. Issues where the SNP and the Greens disagree profoundly. Before that, in May, though, the aim of those parties who argued that the current arrangements are too weak should be to hold the Westminster parties rigorously to account while they squabble with each other and try to forget about us. We’ll be fired up with that massive influx of new and activist members, many of whom will be new to party politics altogether. The Greens and the SNP should be aiming to take not just the 1.6m with us into Scottish polling places in May, but many many more from the 2m who voted No on Thursday. That’s a formidable set of forces.